See also Neophytou & al. (2007) on results of further morphometric studies. Neophytou C., Palli G., Dounavi A. & Aravanopoulos F. A. 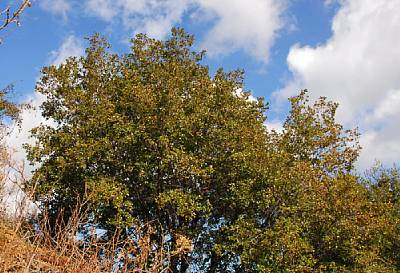 2007: Morphological differentiation and hybridization between Quercus alnifolia Poech and Quercus coccifera L. (Fagaceae) in Cyprus. - Silvae Genet. 56: 271-277. Shrub up to 5 m high. Lamina 2-5.5(-6.5) × 1.2-3(-4) cm, ovate, ovate-oblong or oblong, thick, rigid, leathery, dark shining green above, rather densely silvery to pale golden yellow-tomentose below in young leaves and densely silvery-tomentose in mature leaves, except for the region of the rather prominent midrib and lateral nerves, where it is partly or sparsely tomentose in mature leaves: apex acute, spinose, base shallowly or distinctly cordate, margins spinose dentate with usually upwards-directed pungent teeth, nervation somewhat obscure above, the midrib and lateral nerves rather prominent below. Petiole 4-10 mm long, stellate-tomentose. Male inflorescences extra-axillary, restricted at the lower part of the current year?s shoots. Female flowers in the leaf axils, solitary, sessile or shortly stipitate or in solitary spikes of 2-4, rachis up to 15 mm long; styles 3-4(5), recurved. Cupule about 10 mm in diameter, with strongly recurved, hooked scales. Acorny narrowly obovate or subcylindric, 2-3 cm long, rounded or attenuate at apex, conspicuously apiculate, apiculus distinct, dome-shaped, occasionally with the recurved styles. Source: Hadjikyriakou G. & Hand R. 2006: Quercus, p. 793-797. - In: Hand R. (ed. ), Supplementary notes to the flora of Cyprus V. - Willdenowia 36: 761-809.